This game is in great condition and comes with original box and instructions. I will post 1st Class, free of charge on the Friday morning. I have 100% positive seller feedback and game comes from smoke free home. Any questions please feel free to drop me a message! Super Smash Bros. (Wii U, 2014). Condition is Very Good. Dispatched with Royal Mail 1st Class Large Letter. Super Smash Bros. for Wii U (Nintendo Wii U, 2014) *BRAND NEW & SEALED*. Condition is New. Dispatched with Royal Mail 2nd Class Large Letter. Please check out my other Wii U games and other items for sale. Happy bidding! Only played a couple of times. 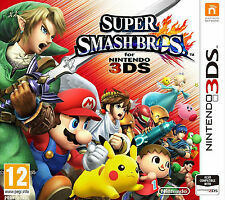 Nintendo 3Ds Super Smash Bros Game. Condition is Like New. Dispatched with Royal Mail 2nd Class Large Letter. Super Smash Bros for Nintendo 3DS. Condition is Very Good. Dispatched with Royal Mail 2nd Class Large Letter. Nintendo 3DS Super Smash Bros Game. Condition is Very Good. No box. NINTENDO SWITCH Super Smash Bros. 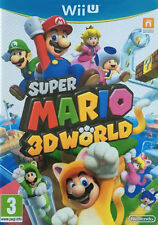 Ultimate Steelbook Case SEALED (NO GAME). Condition is brand new and sealed. No game included. Will be sent by Royal Mail, 1st class. Thanks for looking. Check out my other listings for various nintendo games and accessories, and other collectibles. You are looking at a sealed copy of Super Smash Bros. for the Nintendo Wii U. This item is in new condition, unopened condition and is the PAL version. Super Smash Bros. (3DS, 2014) (Cart Only) No Case . Condition is Like New. Dispatched with Royal Mail 1st Class Large Letter. PLEASE ONLY BID IF YOU UNDERSTAND THAT THE ITEM CAN ONLY BE PLAYED ON U.S OR UNLOCKED CONSOLES. WILL NOT PLAY ON UK CONSOLES. Super Smash Bros. (Nintendo 3DS, 2014) USA version. Can only be played on American consoles or unlocked european or Japanese consoles. Condition is Like New. Dispatched with Royal Mail 1st Class Large Letter. Super Smash Bros. (3DS, 2014). Condition is Like New. Dispatched with Royal Mail 1st Class Large Letter. ⦁ What you see in the pictures is what you get! Sorry to say, but. Nintendo switch, super smash bros game. Nintendo switch, super smash bros game.. Condition is Like New. Dispatched with Royal Mail 1st Class Large Letter. 5 out of 5 stars - Nintendo switch, super smash bros game. 2 product ratings2 product ratings - Nintendo switch, super smash bros game. Super Smash Bros - Nintendo Wii U - DISC ONLY. Super Smash Bros Cart Only (Nintendo 3DS, 2014). Condition is Good. Dispatched with Royal Mail 1st Class Large Letter. Super Smash Bros. - Nintendo Wii. Boxed with Manual. As your amiibo fights, it will develop its own unique attributes and skills, becoming stronger and learning new moves. Super Smash Bros. Get assistance at any point. Dispatched within 24 hours. Title: Super Smash Bros (Nintendo Wii U). Title : Super Smash Bros (Nintendo Wii U). Platform : Nintendo Wii U, Nintendo Wii U. Condition : Very Good. UPC : 045496333614. Release Date : 2014-11-28. Super Smash Bros. Ultimate Limited Edition (Nintendo Switch) New. As they square off in famous locales drawn from the rich history of Nintendo, literally anything can happen in Super Smash Bros. - and usually does. Now you'll never have to stop smashing! Product Summary. Super Smash Bros. (3DS, 2014). What you see is what you get! Super Smash Bros - Nintendo Wii U - Collectors Edition box Includes Amiibo Condition is New. Dispatched with Hermes Tracked. Because we source our products from trusted suppliers it allows us to pass on massive savings to you. Don't delay buy it now before its gone. This may delay your order but you will be advised in this instance. With unique modes, online multiplayer, the ability to customise your fighter and the series' biggest roster of playable fighters ever, Super Smash Bros. for Wii U is truly a clash for the ages. SUPER SMASH BROS. FOR THE NINTENDO WII U. LOADS MORE WII U. WHICH IS FACTORY SEALED. Nintendo Switch Super Smash Bros. Ultimate Limited Edition 'NEW & SEALED'. Compatable with the Nintendo switch only.